How far down in pot should Anova be? Haven't even plugged my in yet; but I want to know how far down in the pot should the unit go? My guess is the heating element at the bottom should not touch the bottom of the pot. The heating element is inside the sleeve. It doesn't extend into the plastic cap at the bottom. There is no problem with the plastic cap touching the bottom of your cooking vessel. Ember's correct, just be certain you have ample water for circulation around your food, somewhere between the Minimum and Maximum marks on your Anova. 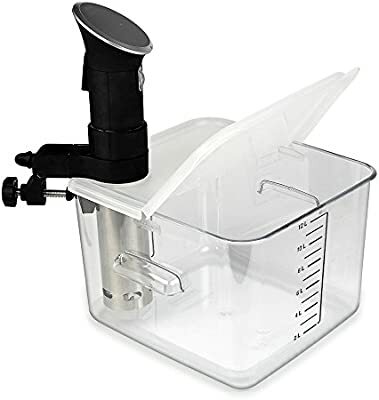 What's the best container for the sous vide and where did u get it? Mike, that's like asking what's the best food. Like most things in life, - it all depends. I'm at that stage in life where i'm trying to downsize and i refuse to buy another single purpose item. For you, and particularly if you do longish cooks of large items, an insulated food transport box might make a lot of economic sense if you have room for it. The Coleman Party Stacker Coolers are very popular for SV cooking. Most users drill a 2-3/8 inch hole in the lid for the Anova so they cook in a closed environment to conserve energy. If I'm gonna spend anymore $$ on equipment, I think (from reading the postings on this site) I need to invest in at least a good cast iron pan for searing. I'd really suggest not buying anything until you've spent time with the device and you understand how you're most likely to use it. There's no point in spending money on a big tub if you're only ever going to cook one or two steaks. Similarly, if you're likely to be doing lots of long and low cooks then an insulated box with a lid is a good move. But there's no need to go overboard. I use an old, antiquated tartan cooler I found in the garage. It works a treat and cost me bupkis. Similarly, don't go out spending hundreds of dollars on a cast iron pan. Hunt through rumble sales and yard sales. You're bound to find an old one that just needs a bit of TLC. I spent a whole 50c on a 12" cast iron skillet at a farm clearing sale. I could tell it was old, probably belonged to the retiring farmer's grandma. It was covered in surface rust, but all it took was a bit of elbow grease and some fine grade steel wool and I have the best quality cast iron skillet you ever did see. When I need size and heat retention that's what I use. If I'm looking to be quick and dirty I use a 10" carbon steel one of a similar history which I can throw around with no fear of damaging it or my toes. The point is: Learn first, buy later. You'll finish up spending less money in the long run. Like mentioned above, it just depends. When I first starting to cook - a deep pot was good enough for me. I cook just for myself most days anyway. I now sometimes use one of those food storage containers for larger cooks. Just consider what your cooking needs are and go from there. To confirm, it's totally fine for the end cap to touch the bottom of the pot.